The National Autistic Society (NAS) has recently conducted a study on what to call people on the spectrum. You can read about it here. There seems to be a lot of debate as to whether one should say, “He or she has autism” or “He or she is autistic.” I’m on the autistic spectrum myself, and people have sometimes asked me, “Do you want me to say you’re autistic or do you want me to say that you have autism?” I decided it might be a good idea for me to write an article about my views. There are many people (mainly neurotypicals) who say you shouldn’t describe someone as “autistic.” It’s better to say they “have autism.” Some say the term “autistic” is offensive, that it defines a person and that it means they’re nothing more than their autism. Would it be offensive to call a fireman a “fireman”? Would it be better to say, “he’s a man who fights fire”? Would it be offensive to say, “Jack is a cool guy”? Would it be better to say, “Jack is a guy who’s cool”? They both mean the same thing, don’t they? So why is it considered offensive to say someone is autistic? And why is it better to say that they “have” autism? To me, that kind of implies that autism is an illness that needs to be cured — which it isn’t. It’s not simply something someone has that needs to be fixed. Autism is a part of what makes a person who they are. I’m not saying autism defines a person entirely, but it is part of who a person is. It’s not like a common cold that someone simply “has.” It’s a rather big part of a person’s life. It affects the whole way someone thinks and processes the world. I know this is the case for me personally. I undoubtedly am autistic. I believe “autistic” isn’t an offensive term unless it’s used in an offensive context. I’ve also heard of a few people with autism who find the term “having autism” offensive because they feel that autism is a part of them and they want to be referred to as “autistic.” Even parents feel this way because they feel like autism is what makes their child who he or she is. “The Autistic Gardener,” a television show in the U.K., uses the term “Autists.” I don’t mind this term, but I don’t want to alienate myself as a totally different type of human being. I’m different, and I do process things in my own way, but I also belong to the human race. I thought it was a fantastic program though. The NAS research on how to describe autism concluded that adults with autism prefer “autistic” and “Aspie” (usually referring to someone with Asperger’s syndrome). However, family members didn’t like the term “Aspie.” Professionals preferred “autism spectrum disorder,” but I think “condition” is better than “disorder.” All groups preferred “on the autism spectrum” and “Asperger’s syndrome.” I think what people with autism want to be called should be listened to more than parents’ and professionals’ preferences. Personally though, I couldn’t care less if someone says I’m autistic or that I have autism. They both mean the same thing in my eyes, and I use both terms. So honestly, you could say I have autism because it is a condition that I was born with and is something I have. I’m also autistic because autism is a part of me. Which term I’d use would really depend on which term sounds better in a particular context. In fact, I’d never even thought about which term was better until I saw all the controversy about it. I’d say no matter which term you use, you’re going to offend some people, so I don’t think it’s anything to worry about. However, you should respect the wishes of a person with autism. If you meet people with autism and they want you to say they “have autism,” then say they have autism. If they prefer you to say they’re autistic, then say they’re autistic. It’s important to respect the individual’s wishes. In my experience, the majority of people with autism don’t seem to care which term you use, just like I don’t, but please get to know the individual. 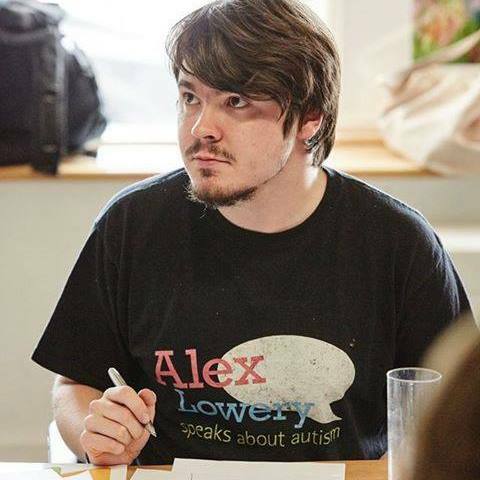 This post originally appeared on Alex Lowery Speaks About Autism. Alex is 24 and is on the autism spectrum. He is passionate about raising awareness of autism. He keeps himself busy writing blog posts, making films and raising autism awareness on Facebook, Twitter and YouTube. Alex is available to provide keynote speeches and autism awareness training for your organization. He has written a book titled, “Thinking Club: A Filmstrip of My Life as a Person With Autism,” which is available on Amazon. Alex’s website is www.alexlowery.co.uk.